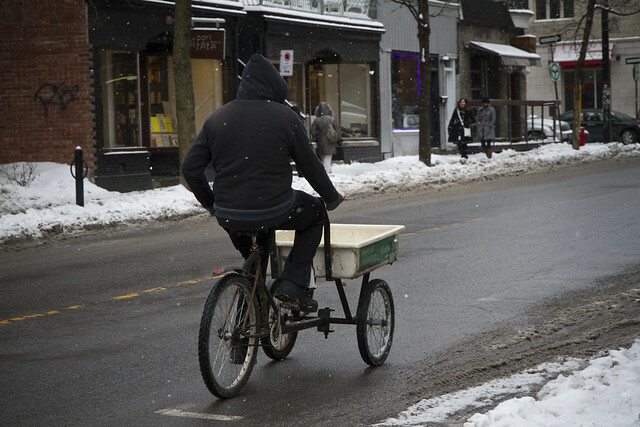 Story: Copenhagenize.com – Bicycle Culture by Design: Montreal Cargo Bikes. I lived in the ‘burbs, so there were no dépanneurs like these where I was, believe me. But in the inner-ring suburbs and in residential areas of the city, they were legion. And this is how the groceries got to your house. From googling around, it appears that many of these have been bought out by Alimentation Couche-Tard Inc. Who is that? Just the same Montreal company that owns Circle K among others (mostly in Canada but growing). Here is a fun map. It barely covers 1 km² yet each red dot is a tiny grocery store. And many of them deliver. On bikes. In the winter.